Take the #CCPhotoADay Instagram Challenge! Visual content is one of the easiest and most effective ways to connect with your audience online. Whether you’re showing off a new product or taking people behind-the-scenes of your business, images can help you connect with your audience and show them what makes your business unique. Best of all, sharing photos and videos has never been easier. With social networks like Instagram, you can share great looking images quickly, right from your mobile device. If you’re on Instagram, hopefully you’ve already seen how effective it can be in showcasing your business and connecting with customers. If you’re new to Instagram, you may still have questions about how the platform works and what type of content you should be creating. 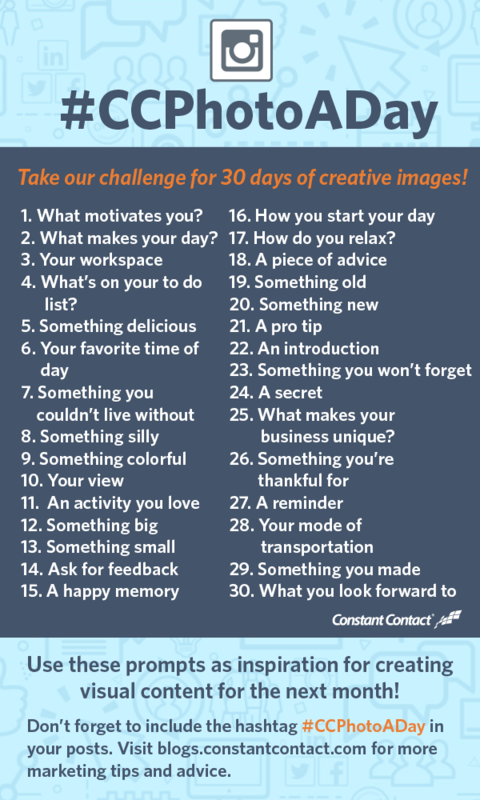 To help you get started, we created our 30 day Instagram challenge! We brainstormed a list of 30 ideas for a month’s worth of inspiration. Use these ideas as prompts for the image you share each day, and add a helpful caption so your followers understand how the image relates to your business. Make sure to use include the hashtag #CCPhotoADay in your caption as well — you can search this hashtag to see what other businesses that are taking the challenge are up to. After completing the challenge, you’ll have a great bank of content and valuable insight into what content your fans and followers are most interested in. Pay attention to what works well for you so you post similar things in the future. Get started with these 30 ideas today! For more advice on how to drive business through visual marketing, join us for a special webinar March 12th. Register here! Check out all the great content other businesses have created while taking the #CCPhotoADay challenge.